Banana Pudding pairs creamy smooth vanilla pudding with chunks of sweet banana and crunchy vanilla wafers. Some like to layer this dessert, like an English Trifle, so you can see the separate layers of pudding, banana slices, and vanilla wafers. Others like to just mix everything together in one big bowl. 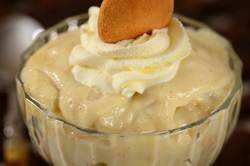 History seems to suggest that Banana Pudding originated in the Southern States where it is still very popular. So popular, in fact, that It is not uncommon to walk into a grocery store and find boxes of vanilla wafers and instant vanilla pudding mixes alongside the bananas. Southerners often like to top their Banana Pudding with a meringue, but I am partial to a dollop of softly whipped cream. Now, we are going to make this Banana Pudding from scratch, which means homemade vanilla pudding. Use the best ingredients you can afford. If possible, use "organic" milk and eggs from vegetarian fed hens. And since vanilla is a prominent flavor in this vanilla pudding it is important to use "pure" vanilla extract. Stay away from the ones labeled "imitation" vanilla extracts as they are made with synthetic vanilla and leave a bitter aftertaste. Also, products labeled 'Vanilla Flavoring' are a combination of pure vanilla extract and imitation vanilla extract and should be avoided. A vanilla pudding is really a 'cooked' custard. There is only one real difference between a pudding and a custard and that is cornstarch (corn flour). Cornstarch is added to a cooked pudding so it becomes thick enough to eat with a spoon. The important thing is that they have to be cooked carefully as we do not want lumps or even worse, scorching. So keep the heat fairly low and use a heavy bottomed saucepan, making sure that you stir constantly with a large heatproof rubber spatula. When stirring it is important to reach the bottom, sides and corners of the saucepan to prevent the pudding from sticking and scorching. Once the pudding has become thick, like mayonnaise, remove it from the heat and add the butter and vanilla extract. Then strain the pudding to get rid of any lumps that may have formed. Once the vanilla pudding has cooled to room temperature, we can make our Banana Pudding. (You can make and refrigerate the vanilla pudding a few days ahead.) Slice the bananas and break the vanilla wafers into bite sized pieces. You can layer the ingredients (like a trifle) or simply mix everything together in a large bowl. Add as much banana and vanilla wafers as you like. If you are using Ladyfingers, instead of vanilla wafers, I like to use a commercial brand because they are thicker and their texture is crisp and very absorbent. (Ladyfingers are finger-shaped cookies that are about 3 1/2 inches long and 1 inch wide (8 x 3.5 cm) that are made with a sponge cake batter. They are called Savoiardi in Italy and are so named because they come from Savoy Italy.) I like to make the Banana Pudding just before serving. That way the vanilla wafers stay nice and crisp. While you can cover and refrigerate the Banana Pudding, the vanilla wafers will soften and start to break down. Garnish with dollops of whipped cream. Lastly, if you would like to try a different version of Banana Pudding, replace the Vanilla Pudding with Butterscotch Pudding. Banana Pudding: In a large stainless steel (or heatproof) bowl whisk together the 1/3 cup (65 grams) sugar, cornstarch, salt, eggs, and egg yolk. Whisk in 1/2 cup (120 ml) of the milk. Set aside while you heat the rest of the milk and sugar. Have ready a fine medium-sized strainer and bowl as you will need to strain the pudding after it is cooked. First, rinse a medium-sized heavy saucepan with cold water and then shake out the excess water. Doing this step prevents the milk from scorching. Then pour the remaining 3 cups (720 ml) of milk, along with 1/4 cup (50 grams) of sugar, into the saucepan and bring just to a boil. Gradually pour the hot milk into the egg mixture, whisking constantly, until the mixture is smooth. Transfer the pudding mixture to a clean large, heavy bottomed saucepan and place over medium-low heat. Cook, stirring constantly, until the mixture thickens to the consistency of mayonnaise (about 3 - 5 minutes). Remove from heat and whisk in the butter and vanilla extract. Pour through the strainer to remove any lumps that may have formed during cooking. Cover and place in the refrigerator to chill for an hour or two (or even overnight). To Make Banana Pudding Trifles: Take 6 or 8 bowls or wine glasses (depending on size) and place a few vanilla wafers or ladyfingers in the bottom of each trifle glass. Spoon a little of the vanilla pudding over the cookies. Peel and slice the bananas and place a layer of bananas over the pudding in each bowl. Place another layer of pudding and bananas, then finish off with a layer of pudding. Garnish each pudding with dollops of softly whipped cream, whole vanilla wafers, slices of banana, and maybe some chocolate shavings. Serve immediately. Leftovers can be covered and refrigerated, but the vanilla wafers will soften.